Sure, we’ve talked dishes before, but sometimes regular old “everyday” dinnerware just doesn’t have the appeal of a unique dish set. We scoured the internet to find you some affordable yet whimsical options to brighten up every meal, every day. Ree Drummond, aka the Pioneer Woman, is known for vibrant colors and whimsical patterns, and her dinnerware sets are no exception. This 12-piece set offers service for four — 10.5″ dinner plates, 8.5″ salad plates, and 6″ bowls. 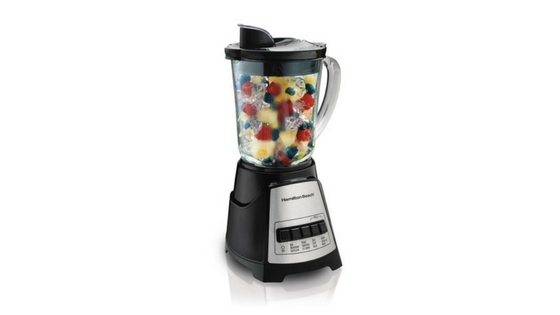 The striking, bold color combos ensure every meal is a happy one. Check the set out here. 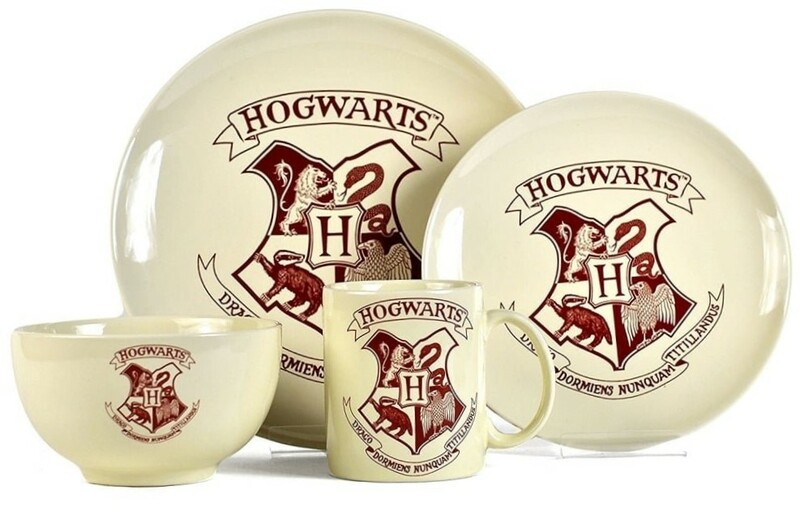 This is only a four-piece set, but it’s definitely a must-have for the Harry Potter fans of the world. It is stoneware, so some might want it for display purposes, but it is suitable for everyday use if you’d prefer. See it here. 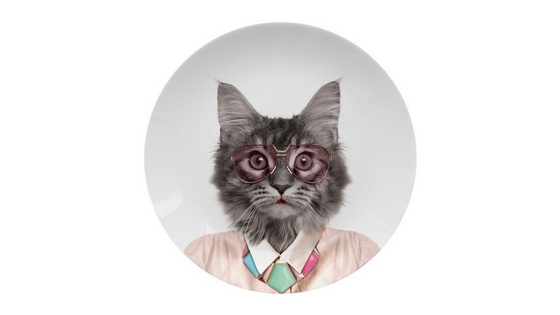 These single plates from Mustard and Co. let you mix and match fun animals, like this “cool cat” (there’s also cool dog, a gorilla in a suit, and more). These could absolutely be fun kids’ plates, but given the price and quality, these seem to make a better whimsical daily (small) dinner plate. See them all here. 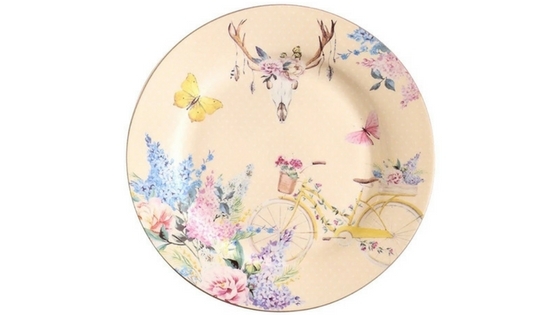 I’m pretty obsessed with this set of bone China salad/appetizer plates. Like, why does the duck have onions on its head? How does it look so elegant that way? There are several different products from this brand, but no plates that are larger than these 7″ plates. However, they would work great with any simple style, like plain white dishes. Get yours here. 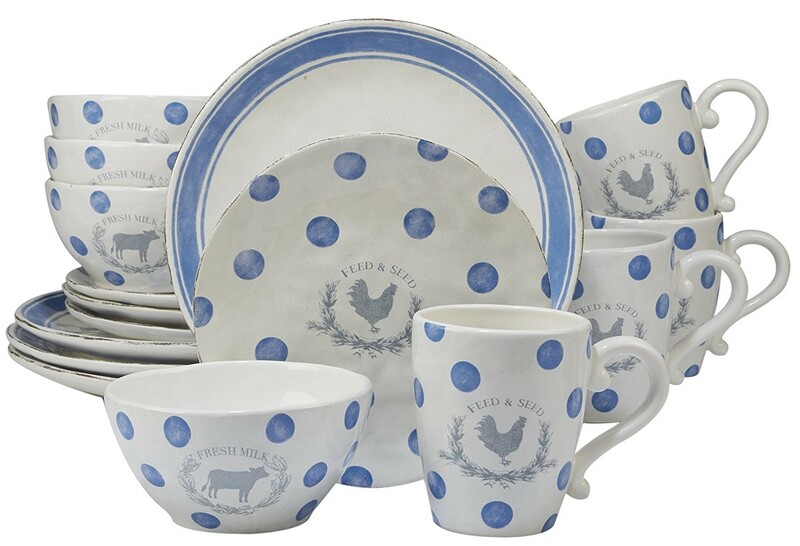 If you love the farmhouse style, you’ll love this beautiful urban farmhouse dish set. With a service for 4, you get large and small plates as well as bowls and mugs. The elegant vintage look features complementary patterns on the different dishes, so you’ll have a beautiful set up that can impress guests or be used every day. See the current price. Note: A reader pointed out that this plate is no longer available. I’m keeping it on the list in case it comes back and will update if I find it or something similar! There seem to be many more small plates with fun and whimsical prints than there are larger dinner plate sizes. 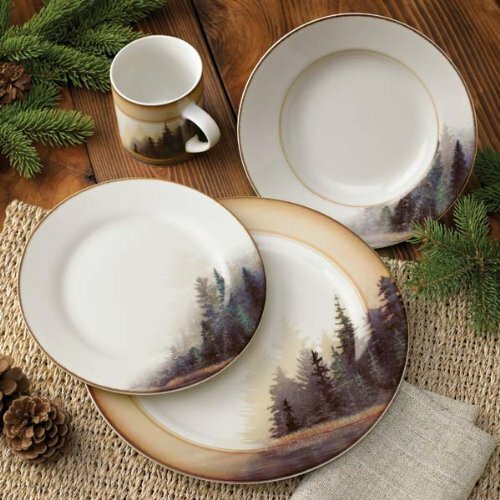 Luckily, you can find essentially any style you want in the smaller plates, and they pair well with contrasting prints or complementary styles. 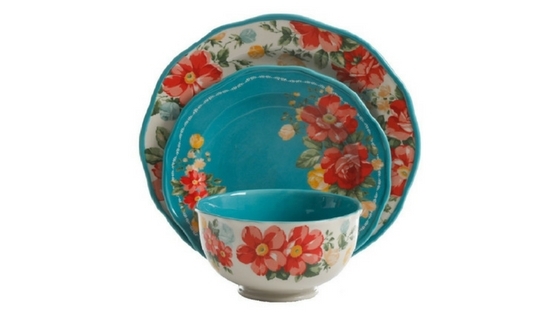 These China plates are super cool and offer a pretty floral pattern with a bit of edginess. See them here. This set is a great way to add a bit of funkiness to your kitchen for a reasonable price and without going overboard with flowers and animals. This coordinating service for 4 is also available in taupe. They are dishwasher and microwave safe. See the red set here. 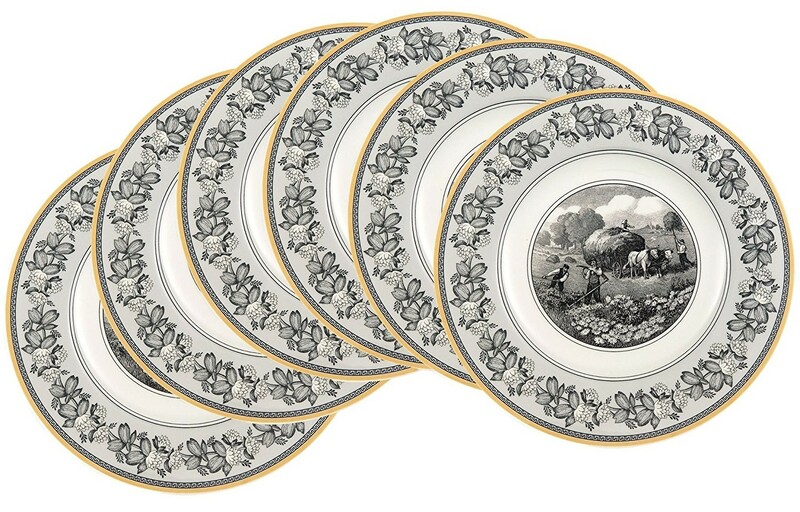 If French countryside is the look you’re going for, this set of 10.5″ dinner plates might be a great start for your design. Made of porcelain and safe for both the dishwasher and microwave, these plates add a touch of elegance to every meal. These are made in Germany and also come in bowls, salad plates, and mugs to complete your set. If you’re more into a whimsical shape over design, check out these flowing modern dishes from Maxwell and Williams. With service for four, this set includes an 11 in dinner plate, 7 in salad plate, 9 in soup bowl, and 13.5 ounce mug. See it here. 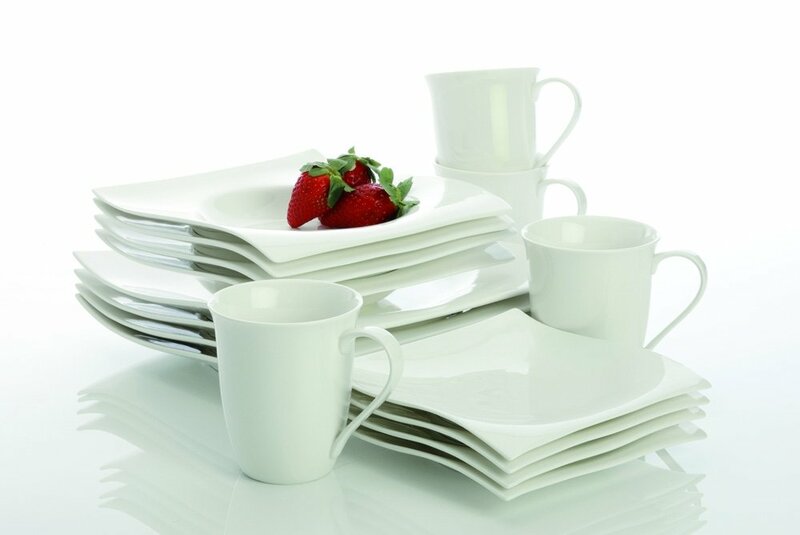 If you’re looking for something classy and long lasting, consider Lenox, one of the most trusted names in dinnerware. 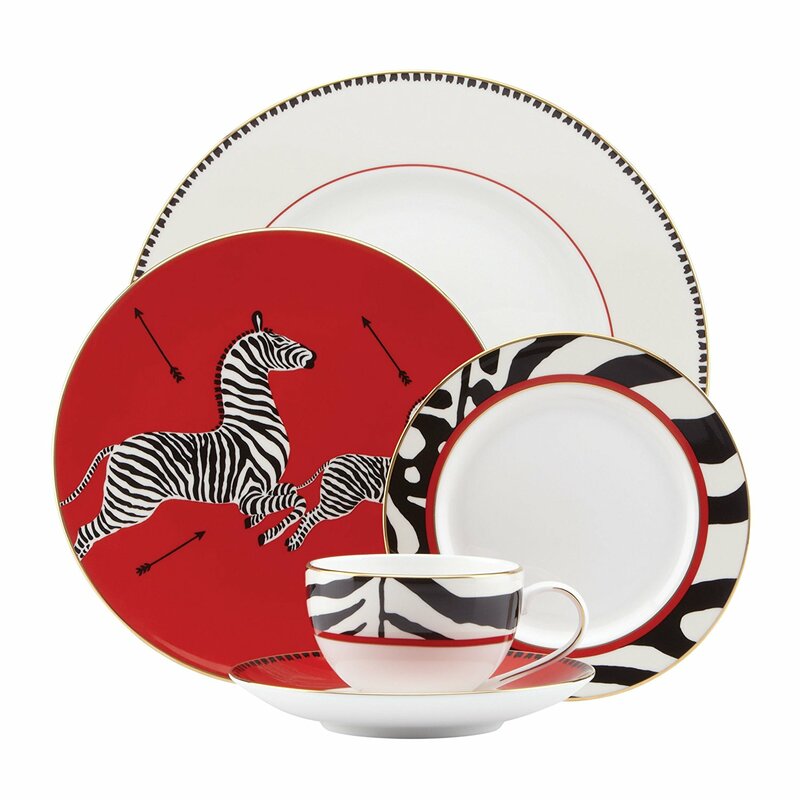 This zebra print set has a classic vibe yet is crafted with the highest level of detail. You’ll pay quite a bit for a full set, but it’s a modern alternative to your grandmother’s China. See the full collection here. 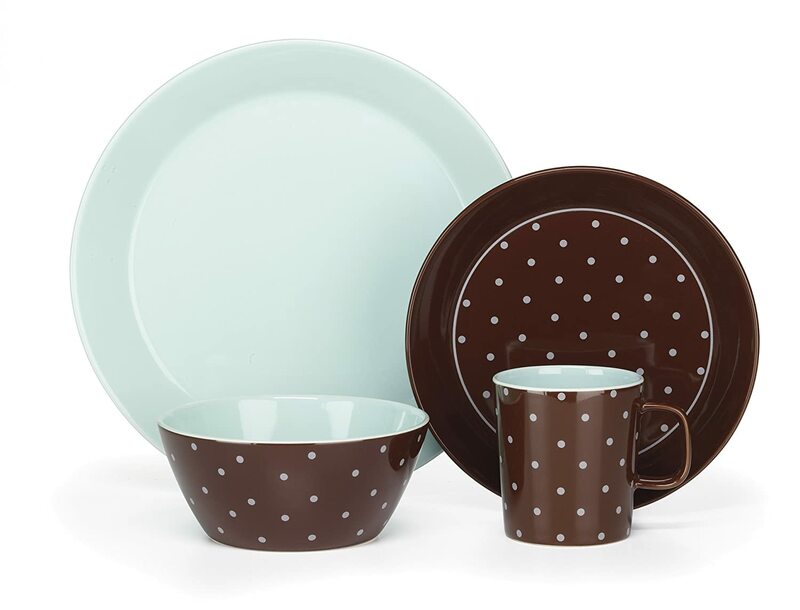 This is a really fun set that combines a fashionable color pattern with whimsical polka dots. It’s also an affordable and useful set that includes service for 4. The sizes are 10.75″ Dinner Plate, 8″ Salad Plate, 5.75″ Bowl, and 11oz Mug. In addition to the mint and teal pattern, this line includes multiple other colors and designs. See them all here. This set isn’t so much fun or whimsical as it is lovely and unique. This is a classy and updated version of outdoorsy dishes meant for cabins. It’s contemporary enough to be used even in the city. The watercolor look appears on each of the 16 pieces in this service for 4 set. See the current price now. 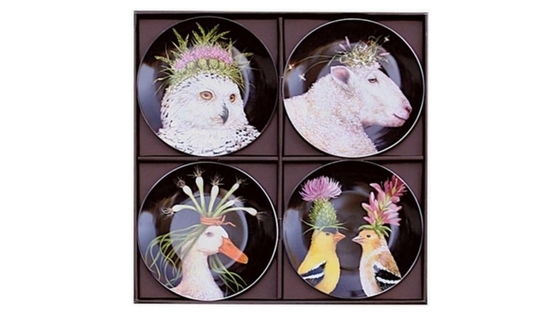 Artists and art lovers will adore this plate collection from the Museum of Modern Art. 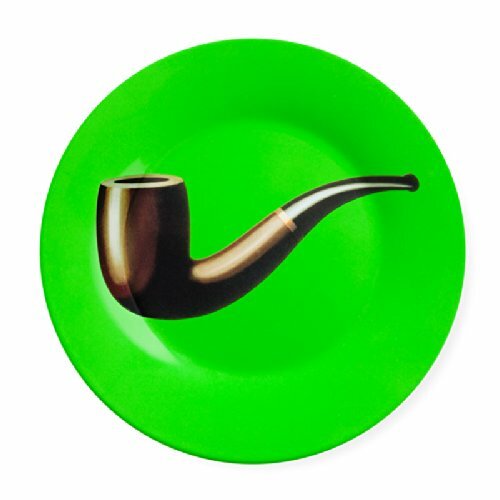 Each plate 7.75″ plate is adorned with a piece from René Magritte’s artwork. These are melamine (unlike any of the other dishes we’ve featured), but they are listed as dishwasher safe. Still, it might be best to handwash these or just use for decoration. See the entire lineup here. 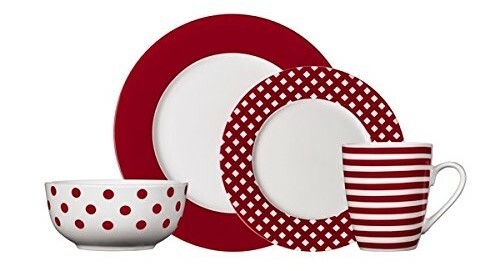 I love these dinnerware. The designing is very beautiful. I am very excited to own these. This would look amazing in some party. And I would love to show them off. I love the 8-Inch-Floral-Dessert Plates; but the link to Amazon is dead. Do you know the manufacturer? The manufacturer was listed as “Home Aid” and it looks like all of the links to Home Aid plates are dead (I searched via Google Images and not one of the designs will pull up). I’ll keep an eye out for something similar and update this page if I find it!